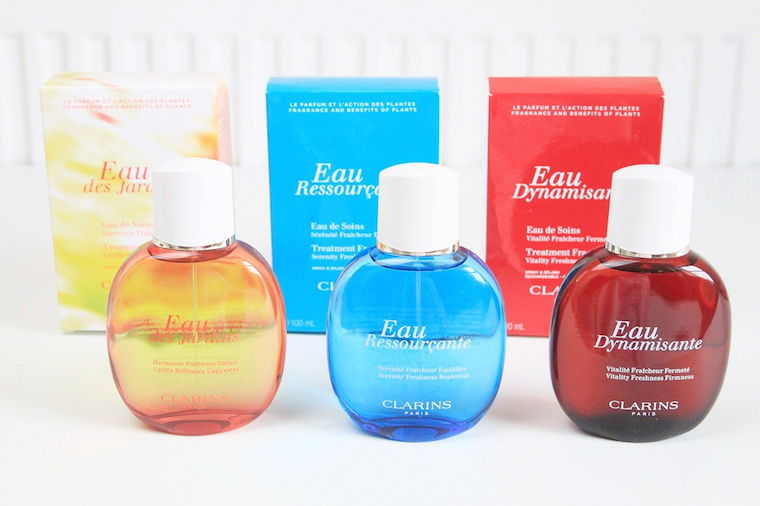 Although I have a vast (bordering on the ridiculous) perfume collection I was yet to try out any from Clarins until these three arrived through my door all at once. The design of the bottles is fairly dated looking in my opinion but I've come to like that about them, they have their own sense of style compared to most perfumes on the shelves. Moving on to the scents, my favourite is Eau Ressourcante which is a light and serene scent, it's pretty much a fresh summer day in a bottle. My second favourite has to be Eau Dynamisante, a deep woody scent which reminds me of the grown up Chanel perfumes. The first version I mentioned is perfect for daytime wear whereas this one is perfectly suited to the evening, they'd both be absolutely perfect to take on holiday. Last up, Eau des Jardins, if you are a fan of fresh floral scents then you will love this but for me it just isn't my cup of tea. I tend to prefer fragrances with layers of notes and this one is very much floral with not much else going on, it's still a lovely daytime option nonetheless if you like a simple scent. The fragrances have an affordable price point and at just £32 for 100ml are much better value for money than most, if you haven't thought to check them out before I'd highly recommend giving them a go. Nice one, fabulous fragrance i want to try red one.